Calmer Choice is proud to share three new roles for three members of our staff. Katie Medlar has been named Program Director, Patty Weinstein has been named Director of School-Based Programming, and L. Forest Malatesta is the new Director of Community-Based Programming. 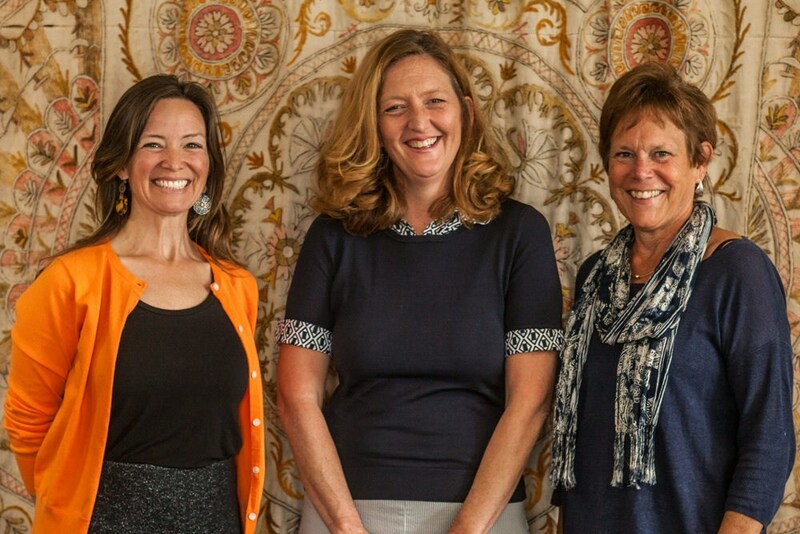 All three are long-time Calmer Choice employees, beginning their tenure with us as instructors in the classroom. Together, they bring a life-long love and commitment to mindfulness, and both personally and professionally embody our mission and vision of a world in which people lead lives of kindness and compassion towards themselves and others. We are honored they have taken this new step with Calmer Choice, and are excited to leverage their collective experience to ensure the strongest and most effective Calmer Choice program yet! Katie Medlar has worked at Calmer Choice from its inception in 2009. In the early days, it was Katie’s encouragement and belief in the work of Calmer Choice that supported the vision of the Founder, Fiona Jensen. Katie started as a member of the Calmer Choice Board of Directors and became a school-based instructor in 2011. Educated at Lesley University, she is an accomplished expert at curriculum design, teaching and facilitating groups. This skill set has allowed her to provide many contributions to Calmer Choice since its inception; she has held positions as Lead Teacher and School-Based Program Director. She was an integral part of the team that created the school- based curriculum. She was also instrumental in creating the Calmer Choice Curriculum for school-based staff and adults. Katie serves as a role model to teachers and students by living the vision: “creating a world is which kids live lives of kindness and compassion; both to themselves and others.” Katie assumed the responsibilities of the Program Director for both school- and community-based programs in 2018. Patty has been with Calmer Choice since it’s start in 2009. Throughout her years with Calmer Choice Patty has supported the organization by giving her service as member of the Board of Directors, helping with curriculum development and being an instructor of both youth and adult programs. Patty brings an abundance of experience in mindful living to all of her work at Calmer Choice and most recently to her new position as Director of School-Based Programming. She also brings that same intention of moment to moment living to her very large family and her personal life. Patty finds much joy in spending time with family, traveling and spending time in nature. If you asked Patty what has been her most treasured accomplishment she would tell you that being a mom is the most precious, the most challenging and the most treasured. Patty holds a Bachelor of Science degree in Elementary Education from Lesley College in Cambridge MA. Patty currently resides in Mashpee MA with her husband of 30 years. L. Forest Malatesta is the Director of Community-Based Programming at Calmer Choice, and is a public health advocate with diverse experience in the fields of health advocacy and education. Ms. Malatesta received her Bachelor of Arts in Sociology from Emory University in 1995, and studied at the Tulane University School of Public Health and Tropical Medicine focusing on International Health and Development. She later worked at the Harvard AIDS Institute in Cambridge, MA on an international prevention and education program, and has held patient health advocacy roles at Outer Cape Health Services in HIV/STI counseling and complex case management. Prior to coming on board with Calmer Choice full-time, Ms. Malatesta helped launch the successful Community Resource Navigator Program. Ms. Malatesta’s interest in the roles of body, mind and spirit in health and healing has also led her to pursue study and training in integrative healing modalities, including acupuncture, Reiki, massage therapy and mindfulness. In addition to her role with Community Based Programming, she is also an instructor with Calmer Choice.